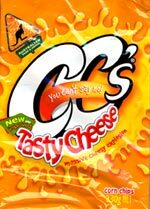 Taste test: CC's have recently relaunched their range of flavors. These corn chips have a very pleasing tasty cheese flavor. 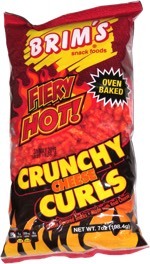 However, the chip itself is not quite up to the standard set by Doritos. The chip seems a little thinner than others, which, although not unpleasant, does not quite satisfy. But still a pretty good corn chip. Smell test: Very appealing tasty cheese aroma. Trivia: CC's were responsible for some of the strangest advertisements every screened. This snack was discovered by Mairéad Doolan at Coles, Australia. Review published .